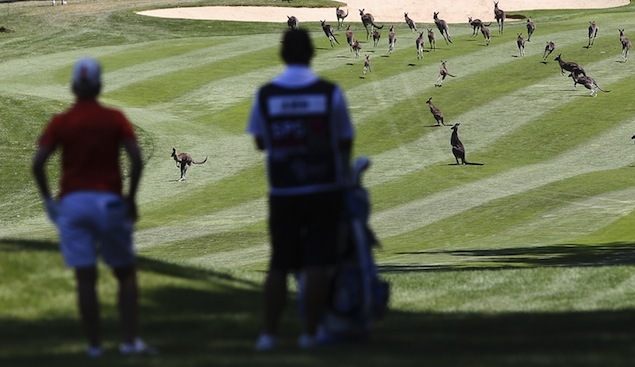 Things were going well in the Australian Open at the Royal Canberra Golf Club, the climate was beautiful, Lydia Ko (as usual) was at her best and suddenly there was an invasion of seven-foot tall kangaroos. Karrie Web was on the ninth hole when the mob of kangaroos moved through the fairway. She had no option than to wait till the animals hopped their way across the course. I’m sure in the meantime she would’ve tried to recollect what Rule 18-1 says, though there doesn’t seem to be a section on marsupials. Click here to see the video version of the incident.